Halle Berry stars in Perfect Stranger, directed by James Foley, as Rowena, an investigative reporter who suspects that Harrison Hill (Bruce Willis), a powerful ad executive, might be responsible for the murder of her friend, so she goes undercover as a temp in his ad agency. Halle Berry has previously acted in all three X-Men films, Gothika, Die Another Day, Swordfish, Bulworth and B*A*P*S. She won an Oscar for Best Actress for her very raw performance in Monster's Ball. I had the privilege to interview her. 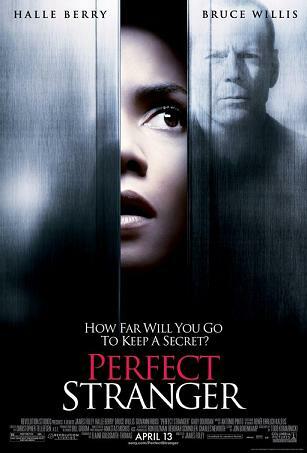 Columbia Pictures will release Perfect Stranger on April 13th, 2007. NYC MOVIE GURU: What attracted you to play the role of Rowena? HB: I love a good psychological thriller that takes you on a journey that bends your mind and forces you to think and look for clues. I love movies with great endings that, somehow, surprise you and make it worth the journey. I had to go back and read the script again because the script left out a lot of the details that would have given [the ending] away long before. I said, “Wait a minute. How exactly does this happen?” I loved it and I was challenged by this character. NYC MOVIE GURU: Do you find it more difficult to find good roles after winning an Oscar? HB: It only made it harder because of the pressure that comes along with that award. I’ve had to work very hard to not allow that pressure to stifle my creativity and my desire to be an individual. I reserve the right to keep making choices that are new for me and trying different things, taking risks and chances and trying different genres. I just don’t want to do lofty, Oscar-winning roles. That’s not was never the plan that I had for myself. NYC MOVIE GURU: Did you think you were meant for the role when you first read the script? HB: When I first read it, I thought, “This is going to be great for somebody.” Then, the realization, sort of, snuck in. I’m so used to fighting for parts, but my manager said, “No, no. They want you for this one.” That really didn’t dawn on me at first. NYC MOVIE GURU: How did Bruce Willis end up co-starring? NYC MOVIE GURU: What was it like working with him? HB: No matter what the scene was, he would find a way to make it funny or make it a comedy. When it was his last line, I would know that there’s about fifteen more things that he’s going to say. He never wanted to stop the scenes—he just went on and on and on. [Director] James Foley, who loves actors and loves to watch acting, would let it go. I was hoping that they’re going to put it on the DVD [extras] and I think they might [do that] because I think it’ll be funny for people to see. NYC MOVIE GURU: Is it true that you were a bit of a klutz on the set? HB: Things would get in my way when I would try to walk, basically. It’s amazing that when I do it, it becomes a big deal, but if the next guy does it, nobody says a thing. But if I fall down five stairs, then [everyone’s like], “Wow! Jesus! Halle has fallen!” I trip a lot, but that’s just the way it goes. NYC MOVIE GURU: How do you feel when you’re acting? HB: I’m filled with fear when I’m [acting]. Usually, when I’m filled with fear, I know that I’m going in the right direction. When I’m scared to death, that means I’m doing something new. I’m daring to work in uncharted waters and I know there’s going to be some growth at the end of the road. I’m willing to walk through the fire and see how I come out on the other end. NYC MOVIE GURU: Were you conscious of the different personalities that your character played while you were acting? HB: I thought about it all the time which is why I was scared of this role. I saw all of the nuances and all of the layers and I knew that my character was never really herself. Maybe for a few moments in the movie you get to see the real character that’s not pretending to be somebody else. The challenge for me was to act as these other people and have the other characters in the movie believe what she was saying, but still not act so well that the audience saw through it. When I wanted the audience to know I was acting, I had to act well enough so that Bruce Willis’ character, [Harrison], would buy it, but not so well that the audience forgot that she was really Rowena acting as Katherine. [Director] James Foley would say to me, “Cut! Rowena doesn’t have an Academy Award. You’ve got to do that over.” So, that was always the balance that I tried to walk. NYC MOVIE GURU: How often do you have privacy? HB: Not very much. Only at home and I spend a lot of time [there]. I value home and I make sure it’s what I want it to be. NYC MOVIE GURU: What is your opinion about the internet? HB: I don’t think we know what the outcome will be of the internet. I see the plusses and the minuses very clearly right now. Time will tell how it will ultimately evolve. Right now, it’s a good thing because I go to it a lot. You can have information under your fingertips. I’m diabetic, so I go into diabetic chatrooms and I learn about the disease and about things I need to know that help me. The internet is also a very negative place because people can say whatever they want and not have to take responsibility for their comments. I always have to take responsibility. If you were in a public position, you have to take responsibility for things you think, it seems like. You have to take responsibility for things you said ten years ago. NYC MOVIE GURU: Do you think your fans really know you? HB: People think they know me, but they really don’t. They’re perfect strangers to me, but, somehow, they don’t realize me as a perfect stranger. Somehow, they think that they know me because of the things that they’ve read, things that they’ve watched me do, and movies that they’ve seen me in. NYC MOVIE GURU: What genre do you want to work in the most? HB: Comedy, but people don’t perceive me that way. That’s been a secret of mine. I haven’t really divulged that side of myself yet.